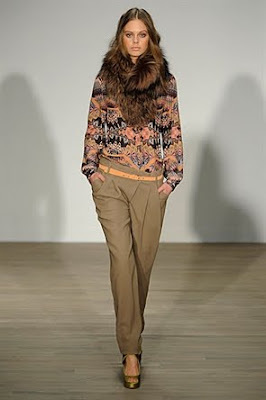 Following New York Fashion Week (held Feb 10-17), the designers at London Fashion Week (held Feb 18-23) also showed collections with Native American influence. Fashionistas have already migrated over to Milan where Italian designers are currently showing their latest Fall/Winter 2011 collections (Feb 23-Mar 1), and the grand finale will be held in Paris, per usual (Mar 1-9). So expect my 'Native' updates about those events within the next two weeks. The reviews from LFW are still coming in, but read on for a list of some of the shows that drew inspiration from Native sources. • Elliot Atkinson's LFW debut featured a collection charting "Americana through the ages" which referenced everything from "ritualistic body piercing, Native American culture and the Scottish Highlands." First up were Native American inspired black woven embossed snakeskin trousers and mini shift dresses embellished with feathers. Click here to read more. • Williamson has consistently incorporated Native elements into his collections, and his latest line is no exception. "Hailing prints found in Red Indian tribes, the British designer’s latest offering had an ethnic-inspired feel that bonds well with his boho aesthetic and use of statement colour." Click here to read more.